Casiopeia Forum - View topic - Casio is working on a new touch calculator? Anti-Cheating? View topic - Casio is working on a new touch calculator? Anti-Cheating? Casio is working on a new touch calculator? Anti-Cheating? I usually search the patents belonging to various companies (like sony, apple, samsung, microsoft...) to know at first hand the technological innovations. 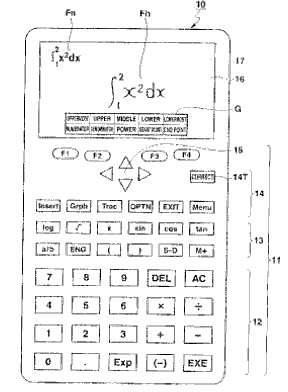 Recently, I decided to do a patent search of Casio and I found what may be the next Casio calculator with touchscreen technology. 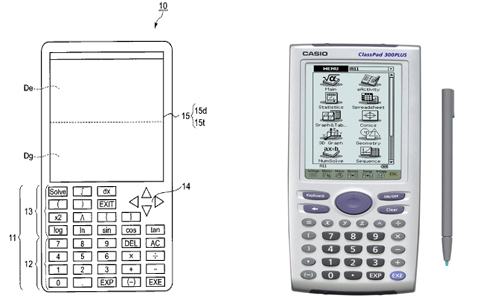 Firstly i found the patent US20090307587 (3 Jun 2009) which apparently seems to be a reformulation of the Casio ClassPad (never launched). The position of the keyboard has been changed in draft. I think this model will not be released, because they recently launched the new Classpad 330 Plus with the same keyboard position. 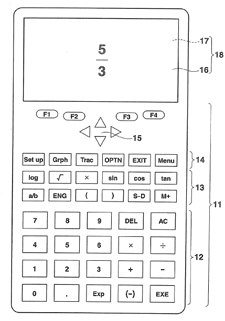 After that, I found something quite interesting, what might be the revolutionary new future model of casio, in US Patent US20110016165 (12 Jul 2010). Apparently, the FKEYS were reduced to 4 (instead of 6 in models like fx9860, prizm...) and SHIFT/ALPHA keys were removed. 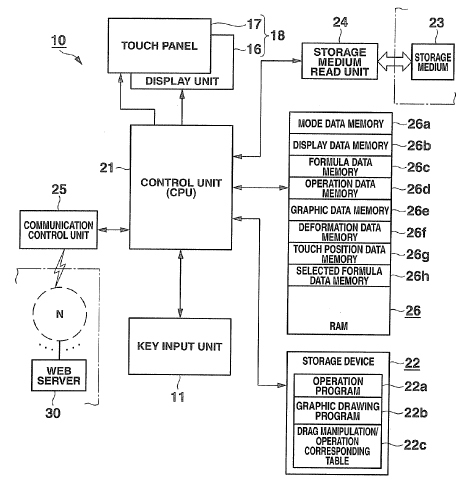 In this patent is also contemplated another possible novelty, a communication control unit that can communicate with web server (maybe a casio alternative to nSpire wifi functions, who knows?). You think you've seen everything? You are mistaken! 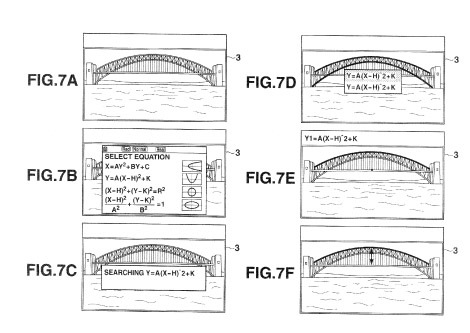 I found yet another patent, with the draft of this mysterious new model and with some more interesting information (patent US20100231597). This mysterious model possibly also have a pen and a function of HANDWRITTEN MATHEMATICAL FORMULA RECOGNITION. No it isnt a new classpad (i think), the proportions of the screen are similar to the fx9860/prizm, maybe a new model/serie or a prizm refresh in future? I really liked this supposed future calculator, who knows, maybe a year from now or two is not launched? During this search, I found a function that can be implemented in the future that will not please many users, contemplated in the patent US7840621, a Anti Cheating feature. With this function will be possible for exemple block acess to e-activities and programs, choose block duration time, etc...using a SD card. After Texas Instruments taking the first steps in combating cheating in tests (with a led in Nspire), Casio will follow the same way? Would like to remind that patents are used to safeguard the rights of an invention, and it is not mandatory that this invention is placed on the market for example. The mode "Protect" is a good idea except for programmers solve problem with program's. totoyo wrote: The mode "Protect" is a good idea except for programmers solve problem with program's. The mode "Protect" is unnecessary in some countries. For exemple in my country theoretically I can use all the features of the calculator (including programs, eact, periodic table, etc...) on the exam and they can not reset. In France it's like? This new feature it's good for teachers, perhaps in countries with more restrictions like Australia and the Usa this can be implemented in future. About SDK, I think this new future model will not have a public official SDK, like prizm. I'm anxious waiting for Casio news in the future Maybe 2013? 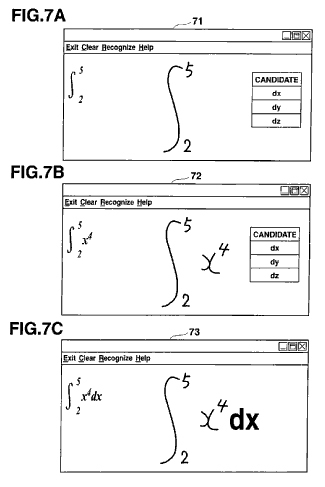 And yes, in this patent there is reference to touchscreen, in schematics drafts. Some omnimaga members questioned about if the screen would be colored or not. According to US20110254862 (7 Abr 2011), there is reference to a color touch screen. If it is even launched, this will be a "super calculator"! Casio officially launched Casio Prizm on CES2011. If they launch a new model, maybe they will show/release it on next CES. The site of Ces2013 is already online with some info about the exhibitors ( include casio). Last edited by cfxm on Sun Jan 20, 2013 5:20 pm, edited 1 time in total. I hope they do release a new Prizm and that it has a built in wifi module. Too much to ask..? happy wrote: I hope they do release a new Prizm and that it has a built in wifi module. Too much to ask..?